Those two parks, combined with some nice birding from the Hudson River Waterfront Walkway along the edge of Bayonne Golf Course on the east side of Bayonne, have gradually increased my Hudson County bird list to 124 species, good for a tie for twelfth all-time on eBird for those keeping score at home. 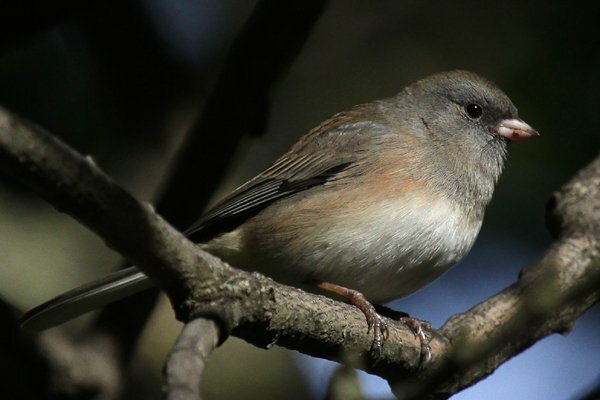 My most recent outing netted me three new species for my Hudson County list – Nelson’s Sparrow, Blackpoll Warbler, and Golden-crowned Kinglet. One of the joys of county listing in a county that you haven’t birded too terribly much is that even relatively common birds are good for an addition to the checklist. I started my morning outing with a walk on the boardwalk through the small salt marsh. I was pleased with the numbers of Pine Siskins that were feeding in the weeds on the margins of the marsh and more pleased when a Marsh Wren responded to my spishing by popping up briefly to see what was making all that noise. Further down the boardwalk I watched a Green Heron do pretty much nothing for a bit. The next big patch of marsh inspired me to spish some more and I was very happy with the result, a new addition to my year list! 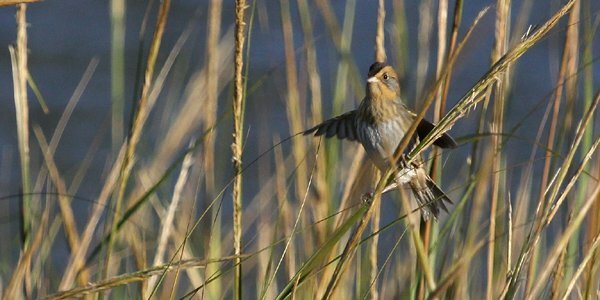 Nelson’s Sparrow – two of them! 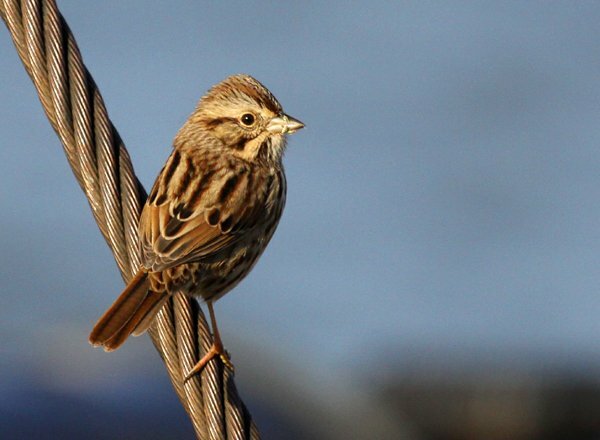 Nelson’s Sparrow is a worthy addition to any county list. After that experience it would be difficult to find much better and, sure enough, I didn’t. Sure, I spotted a bunch more common birds but nothing to compare to a couple of Ammodramus sparrows that I had been hoping would show up in the marsh since I first laid eyes on it back in the spring. I did appreciate this Song Sparrow though. Bizarrely, I now have eleven species of sparrow on my Hudson County list, which matches my number of wood-warblers for the county. That just shouldn’t be but I might as well go with it I guess. What counties do you have somewhat of a list in but nothing terribly impressive? Or is county listing not your thing? I have been birding in Sussex County, the southernmost, in Delaware for a little over a month now and have tallied 145 species. It doesn’t help that I do bird surveys in the county each day though. I started county listing heavily when I was a Penn State and competed with 5 to 10 other birders for the number one spot on eBird each year. Sadly, I think my best finish was 3rd of 4th place. Bayonne Park is the old name of the park. Most of the people I know from Bayonne simply call it “the county park.” The Rutkowski boardwalk is a relatively new addition (as is the Stephen R. Craig name). Nelson’s Sparrow is a really nice find! The closest analogy for me might be Bucks County, PA, where I’ve recorded 89 species, but nothing of significance. I think I have at least one significant bird in each of the counties where I’ve seen over 100 species. Fairfax, VA, would be another candidate (96 mostly common species). I’ve really come to enjoy county listing. Ever since having kids, it’s nice to stay close to home. I’ve enjoyed being able to build a local list in a county that’s not the most heavily birded area (Middlesex). The birding has been very rewarding. @Patrick: Having kids with an “s”? There’s a second one now? Congrats!! I wasn’t into it until I got onto eBird and BirdLog, but now I start a new list every time I cross another county line. It’s especially fun when you find yourself traveling to some podunk county with lots of birds, but not a whole lot of birders. As a result of a weekend trip in June, I’ve still got the last 2012 sightings in Elk County, Pennsylvania for rarities like Hermit Thrush, Yellow Warbler, and Red-tailed Hawk! Talk about an under-birded area. Jochen – Thanks. Yep, two boys. Our oldest, Julian just turned 3 and Elliot turned 1 in July! Craziness!! !